Father John Misty headlines the Audiotree Music Festival Sunday night in Kalamazoo. 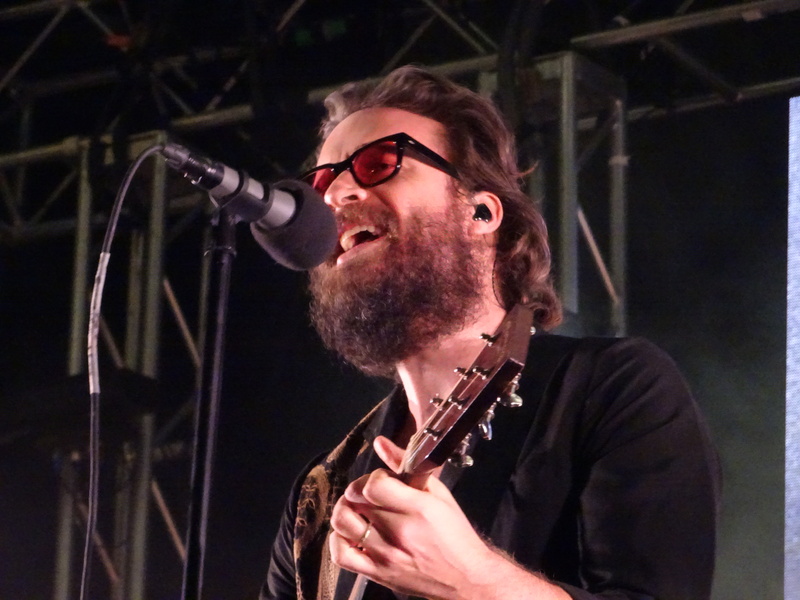 Father John Misty is Kalamazoo’s favorite customer. The Los Angeles indie folk rocker dazzled a Kalamazoo crowd last night with an 80-minute headlining Audiotree Music Festival set at Arcadia Creek Festival Place. Father John Misty (aka Josh Tillman) swaggered onto the Main Stage amid swirling clouds of smoke and deep red lights. He opened his swinging set with the catchy and melodic “Hollywood Forever Cemetery Sings” from his 2012 breakthrough album, “Fear Fun,” and peppered it with six tracks from his latest album, “God’s Favorite Customer,” which dropped in June. Early into his set, Father John Misty sarcastically objected to the large red inflatable Virtue Cider beach balls bouncing toward the stage. The singer’s sardonic sense of humor is just as entertaining as his live show. “That’s stressful for me just to watch people get hit in the head unawares over and over again. Is that a marketing thing? The balls – are they branded? Do you feel more prone to solicit their services after you’ve been hit in the head?” he asked. Father John Misty celebrates his animated alter egos at Audiotree. 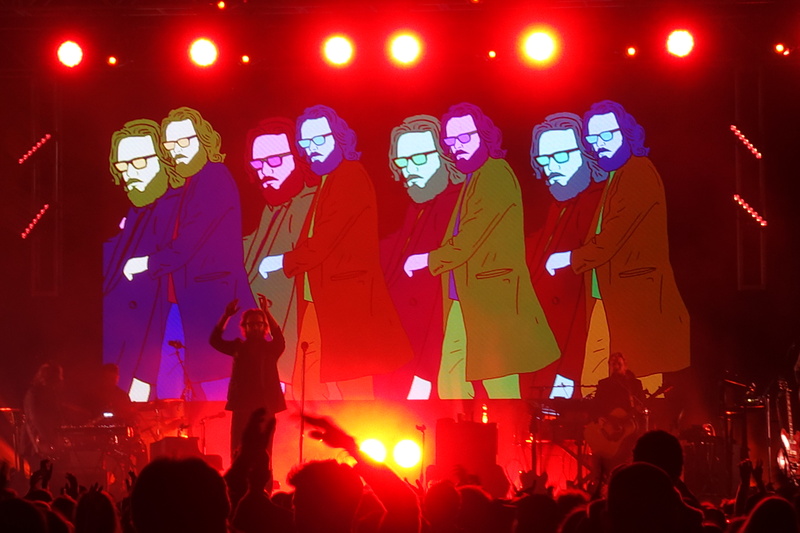 Throughout his performance, Father John Misty featured an oversized background screen with psychedelic-inspired animation, including blooming flowers and moving shapes, and a TV-like static effect. At one point, a cartoon-inspired version of Father John Misty danced across the screen and rode in a convertible across the desert with She-Ra during “Date Night.” For Father John Misty fans, that’s the epitome of his music, humor and charisma. Before the beautiful fall Sunday sun dropped below the horizon, New Jersey indie rockers Real Estate soothed the crowd with their laid-back guitar-sheened tunes. Their shimmery guitar tones served as the ideal musical backdrop for easing into the start of the work week. Frontman Martin Courtney and his bandmates tested several new songs on the crowd from their next album, the follow-up to 2017’s “In Mind.” The band has been busy recording their latest project amidst several east coast dates and festival appearances. Audiotree festivalgoers also caught a splendid second day of emerging guitar-driven rock, including Common Holly, Lushh, Major Murphy, Jake Simmons & The Little Ghosts, Caamp, Lume, Palm, REZN, Post Animal, Pool Holograph, Blitzen Trapper, Slow Mass and Chicano Batman. Audiotree has planted another fruitful forest of emerging rock and sowed the seeds for a successful follow-up festival in 2019.